Diagram of evolution of the (observable part) of the universe from the Big Bang (left) - to the present. The very early universe, from the Planck epoch until the cosmic inflation, or the first picosecond of cosmic time; this period is the domain of active theoretical research, currently beyond the grasp of experiments in particle physics. The early universe, from the Quark epoch to the Photon epoch, or the first 380,000 years of cosmic time, when the familiar forces and elementary particles have emerged but the universe remains in the state of a plasma, followed by the "Dark Ages", from 380,000 years to about 150 million years during which the universe was transparent but no large-scale structures had yet formed. The period of large-scale structure formation, including stellar evolution, galaxy formation and evolution and the formation of galaxy clusters and superclusters, from about 150 million years to present, and prospectively until about 100 billion years of cosmic time; The thin disk of our galaxy began to form at about 5 billion years. The solar system formed at about 4.6 billion years ago, with the earliest traces of life on Earth emerging by about 3.5 billion years ago. The far future, after cessation of stellar formation, with various scenarios for the ultimate fate of the universe. 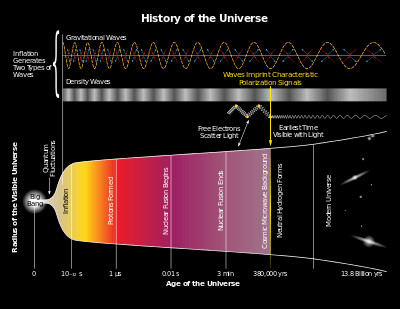 History of the Universe - gravitational waves are hypothesized to arise from cosmic inflation, a faster-than-light expansion just after the Big Bang. Axis scale: billions of years. >1019 GeV The Planck scale is the scale beyond which current physical theories do not have predictive value. The Planck epoch is the time during which physics is assumed to have been dominated by quantum effects of gravity. Grand unification epoch <10−36 s >1016 GeV The three forces of the Standard Model are unified. Inflationary epoch, Electroweak epoch <10−32 s 1028 K–1022 K Cosmic inflation expands space by a factor of the order of 1026 over a time of the order of 10−33 to 10−32 seconds. The universe is supercooled from about 1027 down to 1022 kelvins. The Strong Nuclear Force becomes distinct from the Electroweak Force. Quark epoch >10−12 s 1012 K The forces of the Standard Model have separated, but energies are too high for quarks to coalesce into hadrons, instead forming a quark-gluon plasma. These are the highest energies directly observable in experiment in the Large Hadron Collider. Hadron epoch 10−6 s–1 s 1010 K–109 K Quarks are bound into hadrons. A slight matter-antimatter-asymmetry from the earlier phases (baryon asymmetry) results in an elimination of anti-hadrons. Photon epoch 10 s–1013s; <380 ka 109 K–103 K The universe consists of a plasma of nuclei, electrons and photons; temperatures remain too high for the binding of electrons to nuclei. 1011 K–109 K Protons and neutrons are bound into primordial atomic nuclei. Matter-dominated era 47 ka–10 Ga 3600–0.4 104 K–4 K During this time, the energy density of matter dominates both radiation density and dark energy, resulting in a decelerated metric expansion of space. Recombination 380 ka 1100 4000 K Electrons and atomic nuclei first become bound to form neutral atoms. Photons are no longer in thermal equilibrium with matter and the universe first becomes transparent. The photons of the cosmic microwave background radiation originate at this time. Dark Ages 380 ka–150 Ma 1100–20 4000 K–60 K The time between recombination and the formation of the first stars. During this time, the only radiation emitted was the hydrogen line. The chemistry of life may have begun shortly after the Big Bang, 13.8 billion years ago, during a "habitable epoch" when the Universe was only 10-17 million years old. Stelliferous Era 150 Ma–100 Ga 20– -0.99 60 K–0.03 K The time between the first formation of Population III stars until the cessation of star formation, leaving all stars in the form of degenerate remnants. Reionization 150 Ma–1 Ga 20–6 60 K–19 K The most distant astronomical objects observable with telescopes date to this period; as of 2016, the most remote galaxy observed is GN-z11, at a redshift of 11.09. The earliest "modern" Population III stars are formed in this period. Galaxy formation and evolution 1 Ga–10 Ga 6–0.4 19 K–4 K Galaxies coalesce into "proto-clusters" from about 1 Ga (z=6) and into Galaxy clusters beginning at 3 Gy (z=2.1), and into superclusters from about 5 Gy (z=1.2), see list of galaxy groups and clusters, list of superclusters. Dark-energy-dominated era >10 Ga <0.4 <4 K Matter density falls below dark energy density (vacuum energy), and expansion of space begins to accelerate. This time happens to correspond roughly to the time of the formation of the Solar System and the evolutionary history of life. Far future >100 Ga <-0.99 <0.1 K The Stelliferous Era will end as stars eventually die and fewer are born to replace them, leading to a darkening universe. Various theories suggest a number of subsequent possibilities. Assuming proton decay, matter may eventually evaporate into a Dark Era (heat death). Alternatively the universe may collapse in a Big Crunch. Alternative suggestions include a false vacuum catastrophe or a Big Rip as possible ends to the universe. The Planck epoch is an era in traditional (non-inflationary) big bang cosmology wherein the temperature was so high that the four fundamental forces—electromagnetism, gravitation, weak nuclear interaction, and strong nuclear interaction—were one fundamental force. Little is understood about physics at this temperature; different hypotheses propose different scenarios. Traditional big bang cosmology predicts a gravitational singularity before this time, but this theory relies on general relativity and is expected to break down due to quantum effects. In inflationary cosmology, times before the end of inflation (roughly 10−32 second after the Big Bang) do not follow the traditional big bang timeline. Models attempting to formulate processes of the Planck epoch are speculative proposals for "New Physics". Examples include the Hartle–Hawking initial state, string landscape, string gas cosmology, and the ekpyrotic universe. As the universe expanded and cooled, it crossed transition temperatures at which forces separate from each other. These are phase transitions much like condensation and freezing. The grand unification epoch began when gravitation separated from the other forces of nature, which are collectively known as gauge forces. The non-gravitational physics in this epoch would be described by a so-called grand unified theory (GUT). The grand unification epoch ended when the GUT forces further separate into the strong and electroweak forces. Cosmic inflation was an era of accelerating expansion produced by a hypothesized field called the inflaton, which would have properties similar to the Higgs field and dark energy. While decelerating expansion would magnify deviations from homogeneity, making the universe more chaotic, accelerating expansion would make the universe more homogeneous. A sufficiently long period of inflationary expansion in the past could explain the high degree of homogeneity that is observed in the universe today at large scales, even if the state of the universe before inflation was highly disordered. Inflation ended when the inflaton field decayed into ordinary particles in a process called "reheating", at which point ordinary Big Bang expansion began. The time of reheating is usually quoted as a time "after the Big Bang". This refers to the time that would have passed in traditional (non-inflationary) cosmology between the Big Bang singularity and the universe dropping to the same temperature that was produced by reheating, even though, in inflationary cosmology, the traditional Big Bang did not occur. According to the simplest inflationary models, inflation ended at a temperature corresponding to roughly 10−32 second after the Big Bang. As explained above, this does not imply that the inflationary era lasted less than 10−32 second. In fact, in order to explain the observed homogeneity of the universe, the duration must be longer than 10−32 second. In inflationary cosmology, the earliest meaningful time "after the Big Bang" is the time of the end of inflation. On March 17, 2014, astrophysicists of the BICEP2 collaboration announced the detection of inflationary gravitational waves in the B-mode power spectrum which was interpreted as clear experimental evidence for the theory of inflation. However, on June 19, 2014, lowered confidence in confirming the cosmic inflation findings was reported  and finally, on February 2, 2015, a joint analysis of data from BICEP2/Keck and Planck satellite concluded that the statistical “significance [of the data] is too low to be interpreted as a detection of primordial B-modes” and can be attributed mainly to polarized dust in the Milky Way. According to traditional big bang cosmology, the electroweak epoch began 10−36 seconds after the Big Bang, when the temperature of the universe was low enough (1028 K) to separate the strong force from the electroweak force (the name for the unified forces of electromagnetism and the weak interaction). In inflationary cosmology, the electroweak epoch began when the inflationary epoch ended, at roughly 10−32 seconds. There is currently insufficient observational evidence to explain why the universe contains far more baryons than antibaryons. A candidate explanation for this phenomenon must allow the Sakharov conditions to be satisfied at some time after the end of cosmological inflation. While particle physics suggests asymmetries under which these conditions are met, these asymmetries are too small empirically to account for the observed baryon-antibaryon asymmetry of the universe. After cosmic inflation ends, the universe is filled with a quark–gluon plasma. From this point onwards the physics of the early universe is better understood, and the energies involved in the Quark epoch are directly amenable to experiment. If supersymmetry is a property of our universe, then it must be broken at an energy that is no lower than 1 TeV, the electroweak symmetry scale. The masses of particles and their superpartners would then no longer be equal, which could explain why no superpartners of known particles have ever been observed. Via the Higgs mechanism, all elementary particles interacting with the Higgs field become massive, having been massless at higher energy levels. At the end of this epoch, the fundamental interactions of gravitation, electromagnetism, the strong interaction and the weak interaction have now taken their present forms, and fundamental particles have mass, but the temperature of the universe is still too high to allow quarks to bind together to form hadrons. The quark–gluon plasma that composes the universe cools until hadrons, including baryons such as protons and neutrons, can form. At approximately 1 second after the Big Bang neutrinos decouple and begin traveling freely through space. This cosmic neutrino background, while unlikely to ever be observed in detail since the neutrino energies are very low, is analogous to the cosmic microwave background that was emitted much later. (See above regarding the quark–gluon plasma, under the String Theory epoch.) However, there is strong indirect evidence that the cosmic neutrino background exists, both from Big Bang nucleosynthesis predictions of the helium abundance, and from anisotropies in the cosmic microwave background. The majority of hadrons and anti-hadrons annihilate each other at the end of the hadron epoch, leaving leptons and anti-leptons dominating the mass of the universe. Approximately 10 seconds after the Big Bang the temperature of the universe falls to the point at which new lepton/anti-lepton pairs are no longer created and most leptons and anti-leptons are eliminated in annihilation reactions, leaving a small residue of leptons. After most leptons and anti-leptons are annihilated at the end of the lepton epoch the energy of the universe is dominated by photons. These photons are still interacting frequently with charged protons, electrons and (eventually) nuclei, and continue to do so for the next 380,000 years. During the photon epoch the temperature of the universe falls to the point where atomic nuclei can begin to form. Protons (hydrogen ions) and neutrons begin to combine into atomic nuclei in the process of nuclear fusion. Free neutrons combine with protons to form deuterium. Deuterium rapidly fuses into helium-4. Nucleosynthesis only lasts for about seventeen minutes, since the temperature and density of the universe has fallen to the point where nuclear fusion cannot continue. By this time, all neutrons have been incorporated into helium nuclei. This leaves about three times more hydrogen than helium-4 (by mass) and only trace quantities of other light nuclei. At this time, the densities of non-relativistic matter (atomic nuclei) and relativistic radiation (photons) are equal. The Jeans length, which determines the smallest structures that can form (due to competition between gravitational attraction and pressure effects), begins to fall and perturbations, instead of being wiped out by free-streaming radiation, can begin to grow in amplitude. According to ΛCDM, at this stage, cold dark matter dominates, paving the way for gravitational collapse to amplify the tiny inhomogeneities left by cosmic inflation, making dense regions denser and rarefied regions more rarefied. However, because present theories as to the nature of dark matter are inconclusive, there is as yet no consensus as to its origin at earlier times, as currently exist for baryonic matter. 9 year WMAP data (2012) shows the cosmic microwave background radiation variations throughout the universe from our perspective, though the actual variations are much smoother than the diagram suggests. Hydrogen and helium atoms begin to form as the density of the universe falls. This is thought to have occurred about 377,000 years after the Big Bang. Hydrogen and helium are at the beginning ionized, i.e., no electrons are bound to the nuclei, which (containing positively charged protons) are therefore electrically charged (+1 and +2 respectively). As the universe cools down, the electrons get captured by the ions, forming electrically neutral atoms. This process is relatively fast (and faster for the helium than for the hydrogen), and is known as recombination. At the end of recombination, most of the protons in the universe are bound up in neutral atoms. Therefore, the photons' mean free path becomes effectively infinite and the photons can now travel freely (see Thomson scattering): the universe has become transparent. This cosmic event is usually referred to as decoupling. The photons present at the time of decoupling are the same photons that we see in the cosmic microwave background (CMB) radiation, after being greatly cooled by the expansion of the universe. Around the same time, existing pressure waves within the electron-baryon plasma — known as baryon acoustic oscillations — became embedded in the distribution of matter as it condensed, giving rise to a very slight preference in distribution of large scale objects. 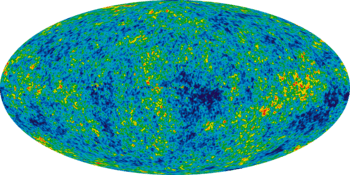 Therefore, the cosmic microwave background is a picture of the universe at the end of this epoch including the tiny fluctuations generated during inflation (see diagram), and the spread of objects such as galaxies in the universe is an indication of the scale and size of the universe as it developed over time. Schematic diagram of the history of the Universe. Before decoupling occurred, most of the photons in the universe were interacting with electrons and protons in the photon–baryon fluid. The universe was opaque or "foggy" as a result. There was light but not light we can now observe through telescopes. The baryonic matter in the universe consisted of ionized plasma, and it only became neutral when it gained free electrons during "recombination", thereby releasing the photons creating the CMB. When the photons were released (or decoupled) the universe became transparent. At this point the only radiation emitted was the 21 cm spin line of neutral hydrogen. There is currently an observational effort underway to detect this faint radiation, as it is in principle an even more powerful tool than the cosmic microwave background for studying the early universe. The Dark Ages are currently thought to have lasted between 150 million to 800 million years after the Big Bang. The October 2010 discovery of UDFy-38135539, the first observed galaxy to have existed during the following reionization epoch, gives us a window into these times. The galaxy earliest in this period observed and thus also the most distant galaxy ever observed is currently on the record of Leiden University's Richard J. Bouwens and Garth D. Illingsworth from UC Observatories/Lick Observatory. They found the galaxy UDFj-39546284 to be at a time some 480 million years after the Big Bang or about halfway through the Cosmic Dark Ages at a distance of about 13.2 billion light-years. More recently, the UDFy-38135539, EGSY8p7 and GN-z11 galaxies were found to be around 380–550 million years after the Big Bang and at a distance of around 13.4 billion light-years. The "Dark Ages" span a period during which the temperature of cosmic background radiation cooled from some 4000 K down to about 60 K. The background temperature was between 373 K and 273 K, allowing the possibility of liquid water, during a period of about 6.6 million years, from about 10 to 17 million after the Big Bang (redshift 137–100). Loeb (2014) speculated that primitive life might in principle have appeared during this window, which he called "the Habitable Epoch of the Early Universe". The Hubble Ultra Deep Fields often showcase galaxies from an ancient era that tell us what the early Stelliferous Age was like. Another Hubble image shows an infant galaxy forming nearby, which means this happened very recently on the cosmological timescale. 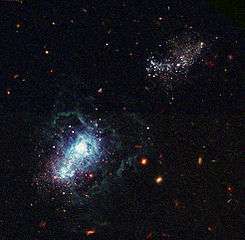 This shows that new galaxy formation in the universe is still occurring. Structure formation in the big bang model proceeds hierarchically, with smaller structures forming before larger ones. The first structures to form are quasars, which are thought to be bright, early active galaxies, and population III stars. Before this epoch, the evolution of the universe could be understood through linear cosmological perturbation theory: that is, all structures could be understood as small deviations from a perfect homogeneous universe. This is computationally relatively easy to study. At this point non-linear structures begin to form, and the computational problem becomes much more difficult, involving, for example, N-body simulations with billions of particles. The first stars and quasars form from gravitational collapse. The intense radiation they emit reionizes the surrounding universe. 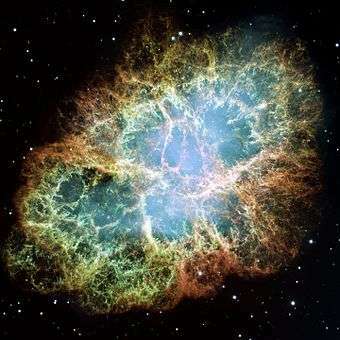 From this point on, most of the universe is composed of plasma. The first stars, most likely Population III stars, form and start the process of turning the light elements that were formed in the Big Bang (hydrogen, helium and lithium) into heavier elements. However, as yet there have been no observed Population III stars, and understanding of them is currently based on computational models of their formation and evolution. Fortunately observations of the Cosmic Microwave Background radiation can be used to date when star formation began in earnest. Analysis of such observations made by the European Space Agency's Planck telescope, as reported by BBC News in early February, 2015, concludes that the first generation of stars lit up 560 million years after the Big Bang. Computer simulated view of the large-scale structure of a part of the universe about 50 million light years across. Large volumes of matter collapse to form a galaxy. Population II stars are formed early on in this process, with Population I stars formed later. Johannes Schedler's project has identified a quasar CFHQS 1641+3755 at 12.7 billion light-years away, when the universe was just 7% of its present age. On July 11, 2007, using the 10-metre Keck II telescope on Mauna Kea, Richard Ellis of the California Institute of Technology at Pasadena and his team found six star forming galaxies about 13.2 billion light years away and therefore created when the universe was only 500 million years old. Only about 10 of these extremely early objects are currently known. More recent observations have shown these ages to be shorter than previously indicated. The most distant galaxy observed as of October 2013 has been reported to be 13.1 billion light years away. The Hubble Ultra Deep Field shows a number of small galaxies merging to form larger ones, at 13 billion light years, when the universe was only 5% its current age. This age estimate is now believed to be slightly shorter. Based upon the emerging science of nucleocosmochronology, the Galactic thin disk of the Milky Way is estimated to have been formed 8.8 ± 1.7 billion years ago. Gravitational attraction pulls galaxies towards each other to form groups, clusters and superclusters. Evolution of the Sun's luminosity, radius and effective temperature compared to the present Sun. The Solar System began forming about 4.6 billion years ago, or about 9 billion years after the Big Bang. A fragment of a molecular cloud made mostly of hydrogen and traces of other elements began to collapse, forming a large sphere in the center which would become the Sun, as well as a surrounding disk. The surrounding accretion disk would coalesce into a multitude of smaller objects that would become planets, asteroids, and comets. The Sun is a late-generation star, and the Solar System incorporates matter created by previous generations of stars. 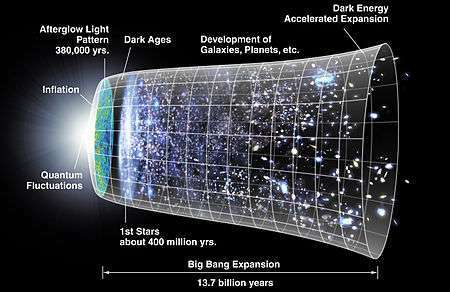 The Big Bang is estimated to have occurred about 13.799 ± 0.021 billion years before present. Since the expansion of the universe appears to be accelerating, its large-scale structure is likely to be the largest structure that will ever form in the universe. The present accelerated expansion prevents any more inflationary structures entering the horizon and prevents new gravitationally bound structures from forming. The Sun being a main sequence star, its future evolution can be predicted with some certainty. Over a timescale of a billion years or more, the Earth and Solar System are unstable. Earth's existing biosphere is expected to vanish in about a billion years, as the Sun's heat production gradually increases to the point that liquid water and life are unlikely; the Earth's magnetic fields, axial tilt and atmosphere are subject to long-term change; and the Solar System itself is chaotic over million- and billion-year timescales. Eventually in around 5.4 billion years from now, the core of the Sun will become hot enough to trigger helium fusion in its surrounding shell. This will cause the outer layers of the star to expand greatly, and the star will enter a phase of its life in which it is called a red giant. Within 7.5 billion years, the Sun will have expanded to a radius of 1.2 AU—256 times its current size, and studies announced in 2008 show that due to tidal interaction between Sun and Earth, Earth would actually fall back into a lower orbit, and get engulfed and incorporated inside the Sun before the Sun reaches its largest size, despite the Sun losing about 38% of its mass. The Sun itself will continue to exist for many billions of years, passing through a number of phases, and eventually ending up as a long-lived white dwarf. Eventually, after billions more years, the Sun will finally cease to shine altogether, becoming a black dwarf. There are several competing scenarios for the possible long-term evolution of the universe. Which of them is going to happen depends on the precise values of physical constants such as the cosmological constant, the possibility of proton decay, and the natural laws beyond the Standard Model. Heat Death: In the case of indefinitely continuing metric expansion of space, the energy density in the universe will decrease until, after an estimated time of 101000 years, it reaches thermodynamic equilibrium and no more structure will be possible. This will happen only after an extremely long time because first, all matter will collapse into black holes, which will then evaporate extremely slowly via Hawking radiation. The universe in this scenario will cease to be able to support life much earlier than this, after some 1014 years or so, when star formation ceases., §IID. In some grand unified theories, proton decay after at least 1034 years will convert the remaining interstellar gas and stellar remnants into leptons (such as positrons and electrons) and photons. Some positrons and electrons will then recombine into photons., §IV, §VF. In this case, the universe has reached a high-entropy state consisting of a bath of particles and low-energy radiation. It is not known however whether it eventually achieves thermodynamic equilibrium., §VIB, VID. The hypothesis of a universal heat death stems from the 1850s ideas of William Thomson (Lord Kelvin) who extrapolated the theory of heat views of mechanical energy loss in nature, as embodied in the first two laws of thermodynamics, to universal operation. Big Rip: For sufficiently large values for the dark energy content of the universe, the expansion rate of the universe will continue to increase without limit. Gravitationally bound systems, such as clusters of galaxies, galaxies, and ultimately the Solar System will be torn apart. Eventually the expansion will be so rapid as to overcome the electromagnetic forces holding molecules and atoms together. Finally even atomic nuclei will be torn apart and the universe as we know it will end in an unusual kind of gravitational singularity. Big Crunch: In the opposite of the "Big Rip" scenario, the metric expansion of space would at some point be reversed and the universe would contract towards a hot, dense state. This is a required element of oscillatory universe scenarios, such as the cyclic model, although a Big Crunch does not necessarily imply an oscillatory universe. Current observations suggest that this model of the universe is unlikely to be correct, and the expansion will continue or even accelerate. Vacuum instability: Cosmology traditionally has assumed a stable or at least metastable universe, but the possibility of a false vacuum in quantum field theory implies that the universe at any point in spacetime might spontaneously collapse into a lower energy state (see Bubble nucleation), a more stable or "true vacuum", which would then expand outward from that point with the speed of light. ↑ The Planck Collaboration in 2015 published the estimate of 13.799 ± 0.021 billion years ago (68% confidence interval). See Table 4 on page 31 of pdf. Planck Collaboration (2015). "Planck 2015 results. XIII. Cosmological parameters". Astronomy & Astrophysics. 594 (13): A13. arXiv:1502.01589 . Bibcode:2016A&A...594A..13P. doi:10.1051/0004-6361/201525830. ↑ del Peloso, E. F. (2005). "The age of the Galactic thin disk from Th/Eu nucleocosmochronology. III. Extended sample". Astronomy and Astrophysics. 440 (3): 1153–1159. arXiv:astro-ph/0506458 . Bibcode:2005A&A...440.1153D. doi:10.1051/0004-6361:20053307. 1 2 Clavin, Whitney (17 March 2014). "NASA Technology Views Birth of the Universe". NASA. Retrieved 17 March 2014. ↑ Overbye, Dennis (17 March 2014). "Detection of Waves in Space Buttresses Landmark Theory of Big Bang". The New York Times. Retrieved 17 March 2014. ↑ Guth, "Phase transitions in the very early universe", in: Hawking, Gibbon, Siklos (eds. ), The Very Early Universe (1985). 1 2 Loeb, Abraham (October 2014). 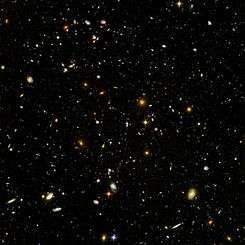 "The Habitable Epoch of the Early Universe". International Journal of Astrobiology. 13 (04): 337–339. doi:10.1017/S1473550414000196. Retrieved 15 December 2014. 1 2 Loeb, Abraham (December 2013). "The Habitable Epoch of the Early Universe". arXiv:1312.0613 . 1 2 Dreifus, Claudia (2 December 2014). "Much-Discussed Views That Go Way Back - Avi Loeb Ponders the Early Universe, Nature and Life". New York Times. Retrieved 3 December 2014. ↑ Overbye, Dennis (March 17, 2014). "Space Ripples Reveal Big Bang's Smoking Gun". The New York Times. Retrieved March 17, 2014. ↑ Overbye, Dennis (March 24, 2014). "Ripples From the Big Bang". New York Times. Retrieved March 24, 2014. 1 2 Ade, P.A.R. (BICEP2 Collaboration); et al. (June 19, 2014). "Detection of B-Mode Polarization at Degree Angular Scales by BICEP2" (PDF). Physical Review Letters. 112: 241101. arXiv:1403.3985 . Bibcode:2014PhRvL.112x1101A. doi:10.1103/PhysRevLett.112.241101. PMID 24996078. Retrieved June 20, 2014. ↑ Overbye, Dennis (June 19, 2014). 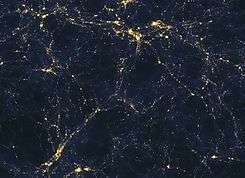 "Astronomers Hedge on Big Bang Detection Claim". New York Times. Retrieved June 20, 2014. ↑ Amos, Jonathan (June 19, 2014). "Cosmic inflation: Confidence lowered for Big Bang signal". BBC News. Retrieved June 20, 2014. ↑ BICEP2/Keck, Planck Collaborations (2015). "A Joint Analysis of BICEP2/Keck Array and Planck Data". Physical Review Letters. 114 (10): 101301. arXiv:1502.00612 . Bibcode:2015PhRvL.114j1301B. doi:10.1103/PhysRevLett.114.101301. ↑ Clavin, Whitney (30 January 2015). "Gravitational Waves from Early Universe Remain Elusive". NASA. Retrieved 30 January 2015. ↑ Overbye, Dennis (30 January 2015). "Speck of Interstellar Dust Obscures Glimpse of Big Bang". New York Times. Retrieved 31 January 2015. ↑ "Gravitational waves from early universe remain elusive". Science Daily. 31 January 2015. Retrieved 3 February 2015. ↑ Gannon, Megan (December 21, 2012). "New 'Baby Picture' of Universe Unveiled". Space.com. Retrieved December 21, 2012. ↑ Bennett, C.L. ; Larson, L.; Weiland, J.L. ; Jarosk, N.; Hinshaw, N.; Odegard, N.; Smith, K.M. ; Hill, R.S. ; Gold, B.; Halpern, M.; Komatsu, E.; Nolta, M.R. ; Page, L.; Spergel, D.N. ; Wollack, E.; Dunkley, J.; Kogut, A.; Limon, M.; Meyer, S.S.; Tucker, G.S. ; Wright, E.L. (2013). "Nine-Year Wilkinson Microwave Anisotropy Probe (WMAP) Observations: Final Maps and Results". The Astrophysical Journal Supplement Series. 208: 20. arXiv:1212.5225 . Bibcode:2013ApJS..208...20B. doi:10.1088/0067-0049/208/2/20. ↑ Hinshaw, G.; et al. (2009). "Five-Year Wilkinson Microwave Anisotropy Probe (WMAP) Observations: Data Processing, Sky Maps, and Basic Results" (PDF). Astrophysical Journal Supplement. 180 (2): 225–245. arXiv:0803.0732 . Bibcode:2009ApJS..180..225H. doi:10.1088/0067-0049/180/2/225. ↑ Amos, Jonathan (2012-11-13). "Quasars illustrate dark energy's roller coaster ride". BBC News. Retrieved 13 November 2012. ↑ "ALMA Observes Most Distant Oxygen Ever". Retrieved 22 June 2016. ↑ Wall, Mike (December 12, 2012). "Ancient Galaxy May Be Most Distant Ever Seen". Space.com. Retrieved December 12, 2012. ↑ Andrew Pontzen and Hiranya Peiris, Illuminating illumination: what lights up the universe?, UCLA press release, 27 August 2014. ↑ Planck Collaboration (2015). "Planck 2015 results. XIII. Cosmological parameters (See Table 4 on page 31 of PDF).". arXiv:1502.01589 . 1 2 K. P. Schroder; Robert Connon Smith (2008). "Distant future of the Sun and Earth revisited". Monthly Notices of the Royal Astronomical Society. 386 (1): 155–163. arXiv:0801.4031 . Bibcode:2008MNRAS.386..155S. doi:10.1111/j.1365-2966.2008.13022.x. ↑ J. Laskar (1994). "Large-scale chaos in the solar system". Astronomy and Astrophysics. 287: L9–L12. Bibcode:1994A&A...287L...9L. ↑ Zeilik & Gregory 1998, p. 320–321. ↑ "Introduction to Cataclysmic Variables (CVs)". NASA Goddard Space Center. 2006. Retrieved 2006-12-29. ↑ Palmer, Jason (22 February 2008). "Hope dims that Earth will survive Sun's death". New Scientist. ↑ G. Fontaine; P. Brassard; P. Bergeron (2001). "The Potential of White Dwarf Cosmochronology". Publications of the Astronomical Society of the Pacific. 113 (782): 409–435. Bibcode:2001PASP..113..409F. doi:10.1086/319535. Retrieved 2008-05-11. 1 2 3 A dying universe: the long-term fate and evolution of astrophysical objects, Fred C. Adams and Gregory Laughlin, Reviews of Modern Physics 69, #2 (April 1997), pp. 337–372. Bibcode: 1997RvMP...69..337A. doi:10.1103/RevModPhys.69.337. ↑ M.S. Turner; F. Wilczek (1982). "Is our vacuum metastable?" (PDF). Nature. 298 (5875): 633–634. Bibcode:1982Natur.298..633T. doi:10.1038/298633a0. Retrieved 2015-10-31. ↑ Coleman, Sidney; De Luccia, Frank (1980-06-15). "Gravitational effects on and of vacuum decay" (PDF). Physical Review D. D21 (12): 3305–3315. Bibcode:1980PhRvD..21.3305C. doi:10.1103/PhysRevD.21.3305. ↑ M. Stone (1976). "Lifetime and decay of excited vacuum states". Phys. Rev. D. 14 (12): 3568–3573. Bibcode:1976PhRvD..14.3568S. doi:10.1103/PhysRevD.14.3568. ↑ P.H. Frampton (1976). "Vacuum Instability and Higgs Scalar Mass". Phys. Rev. Lett. 37 (21): 1378–1380. Bibcode:1976PhRvL..37.1378F. doi:10.1103/PhysRevLett.37.1378. ↑ P.H. Frampton (1977). "Consequences of Vacuum Instability in Quantum Field Theory". Phys. Rev. D15 (10): 2922–28. Bibcode:1977PhRvD..15.2922F. doi:10.1103/PhysRevD.15.2922. PBS Online (2000). From the Big Bang to the End of the Universe – The Mysteries of Deep Space Timeline. Retrieved March 24, 2005. Schulman, Eric (1997). The History of the Universe in 200 Words or Less. Retrieved March 24, 2005. Deep Time: Crash Course Astronomy #45. Retrieved October 2, 2016. Space Telescope Science Institute Office of Public Outreach (2005). Home of the Hubble Space Telescope. Retrieved March 24, 2005. Cosmic Evolution is a multi-media web site that explores the cosmic-evolutionary scenario from big bang to humankind. Once Upon A Universe - Story of the Universe told in 13 chapters. Science communication site supported by STFC.